This summer, as the Obama Administration prepared to confront Iran with proof of its undisclosed uranium-enrichment plant in Qum, CIA Director Leon Panetta ordered his staff to work with European intelligence agencies to compile a comprehensive presentation about the facility. Although the Iranians had taken great pains to keep the facility a secret, building it into a mountain 100 miles southwest from Tehran, the CIA had known about it for three years. Panetta was told about Qum during the White House transition period in January. "This was presented at that time as something nobody knew about, a secret facility," he told TIME in an exclusive interview. "It was built into a mountain; obviously that raised question marks." Panetta said that after he was confirmed as the agency's director, "we spent the next months trying to get better intel about what was going on there ... and conducting covert operations into that area." As part of that effort, the CIA worked with British and French intelligence, which had also been on the lookout for the secret plant. They knew there had to be one; once Iran's primary enrichment plan in Natanz was revealed, in 2002, it was assumed that the Iranians would build a second one somewhere. 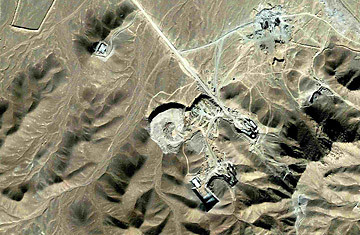 The Qum site first attracted the attention of Western intelligence agencies in 2006, when the CIA noted unusual activity at the mountain: the Iranians moved an anti-aircraft battery to the site, a clear sign that something important was being built there. Exactly what, however, was hard to know. "We didn't jump to any conclusions and considered a number of alternatives," says a U.S. counterterrorism official. Iran is suspected of having a number of secret research labs and manufacturing facilities linked to its nuclear program. Roland Jacquard, an independent security and terrorism consultant in Paris, says there was some debate among analysts about the Qum site. While some said it had to be a nuclear facility, "others warned it could also easily be a decoy the Iranians wanted to fix Western attention to as [it] continued clandestine work on another facility elsewhere," he says. Jacquard says doubts gradually vanished as European and U.S. intelligence agencies shared information, "and the Americans could use that alongside what was being learned through the infiltration of Iranian computers." Panetta won't say what kind of covert operations were carried out or how the agency was able to conclude that the Qum facility was nuclear. The counterterrorism officials says only that "our body of knowledge, based on multiple sources, grew to the point that allowed us earlier this year to reach the high-confidence conclusion that this was a covert nuclear facility." By the spring, there was little doubt left about what exactly was being constructed in the mountain (Iran has declared that the plant is not yet operational, and U.S. officials have agreed with that assessment). That, a senior Administration official told reporters this week, was when the White House decided that knowledge of the Qum facility would be a useful card to put on the table when Iran finally agreed to talk to the six major powers (the U.S., China, Russia, U.K., France and Germany). If the Iranians failed to come to the talks, Obama would reveal the secret facility in his speech to the U.N. General Assembly in September. In an interesting reversal of roles from the Bush era, the Europeans were pushing for the plant to be outed at once, while the U.S. was more cautious. "The Americans seem to have become more patient as their dossier on Iran has gotten fuller, while the Europeans are getting more anxious about taking care of this matter as they've learned more," says Jacquard. From then on, the challenge was to keep the information secret. Panetta said he ordered the presentation to be readied "in the event that that information leaked out or that [the Obama Administration] wanted to present it to the International Atomic Energy Agency." British, French and Israeli intelligence agencies were involved in creating the presentation, he added. U.S. officials believe that it was only when Iran found out that its cover had been blown that it chose to own up to the plant's existence  although how it might have learned of Washington's discovery remains unclear. On the eve of the U.N. General Assembly last month, the Iranians sent the IAEA a terse note, acknowledging the presence of the Qum facility. The next day, Panetta dispatched a team to the IAEA's headquarters in Vienna to make the presentation. See pictures of IAEA director Mohamed ElBaradei.